Grill with confidence at any level and enjoy professional grade results with SABER gas grills. The patented SABER infrared cooking system allows you to cook up juicier and more flavorful meals than traditional systems that use dry convection air. The unique SABER cooking grates and infrared emitters prevent flare-ups and direct airflow away from the cooking surface, providing evenly distributed, indirect heat for maximum moisture retention while grilling. The cooking grates also catch any drippings and debris, protecting the burners and creating that familiar BBQ sizzle as foods are infused with more juicy flavor. Designed with fuel efficiency in mind, the SABER infrared cooking system delivers quality results faster than most gas grills while consuming 30-percent less fuel. The burners, emitters and grates are made of 304 commercial grade stainless steel, ensuring long-lasting performance in your outdoor kitchen. The SABER Cast 500 32-inch gas grill features a 304-grade stainless steel lid with heavy-duty cast-aluminum end caps. Three 8,000 BTU gas burners, provide evenly-distributed heat across a 500 square-inch cooking surface. An adjustable, enamel-coated warming rack folds down to keep foods warm and can be folded away for additional space when using a rotisserie kit with the integrated rod holders (rotisserie kit sold separately). Precisely manage grilling temperatures across three cooking zones using individual burner control knobs, ensuring reliable start-up with integrated push-button electronic ignition. Three grate-level temperature gauges allow you to easily monitor grilling temperatures, even while the lid is lifted. Two 304-grade stainless steel side shelves provide convenient workspace with die-cast BBQ tool holders and a towel bar, as well as a 10,000 BTU side-burner in the left shelf for preparing sides and sauces while you grill. Cleaning your SABER grill after meals is easy thanks to the porcelain-coated burner boxes, firebox liners and front-access grease tray, simply burn off and brush away any remaining debris with the included grate scraper. The SABER EZ assembly cart features fully-enclosed, powder-coated storage space with stainless steel access doors and has heavy-duty, nylon locking casters for easy placement. * Some orders received will go through our fraud prevention department. If your order is selected, you will be notified and your order may be delayed up to three (3) additional business days. Contact one of our knowledgeable experts to help guide you through your purchase. Give us a call, toll free at 1-877-743-2269 or Live Chat. We don't have any customer images for this item yet. Want to leave a review for this product? 0% of customers recommend this product. 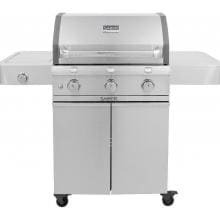 Have a question about the Saber Cast 500 32-Inch 3-Burner Infrared Propane Gas Grill With Side Burner - R50CC0317? Be the first to ask! Want to ask a question about this product?